Deliver three times a week, one box per person at the same time. When self-service delivery, you need to print out customs invoices and forms. Please paste a post office form on the box. 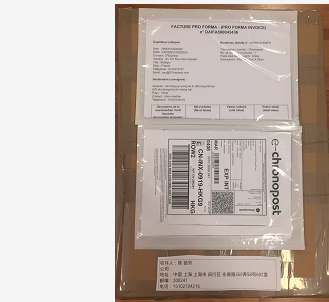 Two customs bags, one for customs invoices, one for the second post office form, and two customs bags and post office forms are pasted on the box together. Head office address: 36 Rue Du Caire 75002, Réaumur sébastopol station on metro line 3 and metro Line 4, open from Monday to Saturday from 9:30 to 18:30. The delivery date will be delivered on 8-12 working days (except holidays). Only sent to mainland China, high security! Store delivery and self service delivery are available. 注意！奶粉保税专线包裹必须如实申报所邮寄的奶粉，不能夹带除申报奶粉外的任何产品，如有夹带或瞒报者请自行承担后果。Be carefMilk powder bonded line package must faithfully declare the mailed milk powder, can not carry any products except the declared milk powder, if there are entrained or concealed, please bear the consequences.